Baby Bassenet comes with head down position from both sides, IV stand and large shelf for placing monitors and consumables , soft mattress for the baby . Our organization offers a diverse range of elegant Baby Bassinets. These are provided with support system called swivel castors for new born babies during warming process. - 5 cms castors I.V Rod. Size: 810 × 460 × 960 mm. 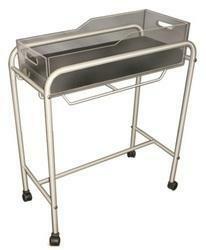 As per the specific needs of the clients, we are engaged in providing a high quality range of Baby Bassinet. Preprex transparent Crib with mattress. Laminated cupboard with plate form. 5 cm coasters. I.V. Rod. Fleischhacker Manufacturing Co. India Pvt. 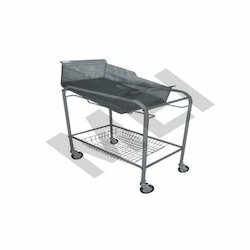 Ltd.
Hospital Infant Bed / Child Cot / Baby Bassinet Size: L 105mm W 45mm H 1045mm 855mm (Height Adjustable by hydraulic system). In build touch keyboard. Weight scale to Measure baby weight . Tilt angle 15, easy for mother and baby to communicate and feed. Hand rail could be placed flat or at 90 angle. Can be used as a mosquito net support. With head down position from both sides, IV stand and large shelf for placing monitors etc. Our organization is engaged in manufacturing and supplying premium array of Infant Bassinets. These infant bassinets are widely used in different hospitals, clinics and laying-in centers for receiving newborn babies.